Performs a variety of routine and complex technical work in connection with the duty to enforce all of the provisions of the Florida Building Code, Miami-Dade County Code, City Code, and other related codes. This position is classified as a non-exempt, full-time position with a 37.5 hour work-week. Inspects new and existing buildings and structures to ensure compliance with the applicable codes and approved plans and specifications. Inspects residential and commercial buildings to ensure that they conform to the applicable codes. Issues verbal and written notices of code violation and citations for code violations. Assists in resolving complex and sensitive customer service issues, either personally, by telephone or in writing. Maintains records and documents of customer service issues and resolutions. Researches problems and complaints regarding commercial and residential work and code compliance. Observes building conditions and issues notices of violations for corrections of violations. Attends annual continuing education courses for re-certification. Oversees powers and duties as may be delegated by the Building Official. Enforces and explains pertinent sections of the Building Code. Prepares reports of Presents code violation cases and presents them to the Code Compliance Special master. Maintains high ethical, honesty and moral standards. Performs any other duties as assigned by the Building Official and/or Chief Building Inspector. A High School diploma or a GED equivalent is required, with a Bachelor's degree being strongly preferred, supplemented by five years of related experience. Standard certification by the State of Florida Department of Business and Professional Regulation as an inspector. Provisional certification will be acceptable for the period allowed prior to obtaining standard certification. Must meet the licensing qualifications set forth in Article II Chapter 8, Section 8-21 of the Code of Miami-Dade County for Building Inspector with commercial/residential roofing inspector a plus and have or be able to obtain a certificate from the Miami-Dade County Board of Rules and Appeals. Plans Examiner certification is a plus. Must possess a valid Florida Driver's License. Apply technical knowledge and follow proper inspection techniques to examine workmanship, methods and materials of construction. Extensive knowledge of current codes and regulatory standards governing the state's building construction industry in the respective trade/discipline. Extensive knowledge of all functions relevant to the processing and approval of building construction projects in the respective trade/discipline, e.g. plans review, licensing, permitting, inspections. Ability to get along with others and work effectively and courteously with the public and fellow workers. Ability to detect deviations from plans, regulations and standard construction practices. Ability to operate basic office equipment, e.g., computer terminals, printers, copy machines, telephone systems, facsimile machines. Ability to use computers for data entry. Must be fluent in the English language. Ability to communicate in Spanish is a plus. The minimum requirements may be waived by the City Manager. Ability to balance on narrow, slippery or erratically moving surfaces; climb, kneel, crawl, crouch, feel, finger, grasp handle; receive information through oral communication; make rational decisions; pull, push, reach; express ideas through speaking accurately/loudly/quickly; use visual acuity to perform activities such as viewing a computer terminal, making general observations of facilities, operating heavy equipment and making visual inspections; and walk from one work site to another. Ability to exert up to 20 pounds of force occasionally, and/or up to 10 pounds of force to move objects. Doral, incorporated on January 28, 2003, in one of thirty-four municipalities in Miami-Dade County, Florida. Conveniently located just one mile from Miami International Airport and twelve miles from Downtown Miami, our City is home to approximately 58,000 residents and regularly hosts in excess of 100,000 people who work within the City. The City of Doral occupies a land area of 15 square miles bordered on the west by the Ronald Reagan Turnpike, to the north by the Town of Medley, to the east by the Palmetto Expressway and to the South by the City of Sweetwater. 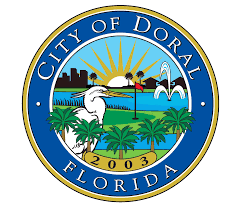 The City of Doral offers a wide range of services through its departments including the Office of the City Manager, Office of the City Clerk, Finance Department, Community Development Department, Public Works Department, Parks and Recreation Department, and Police Department. Described as the premier place to live, work, learn and play, our many assets provide for a superior quality of life in an urban center known for its commerce.